A lot of attendees were very interested in discovery and classification of files because many realized they don’t know what they have and where it’s located. One executive I talked to had a good handle on her databases, but when it came to downloading reports from those databases and the documents employees create every day, she acknowledged it’s a lot more challenging. She mentioned there’s a lot of redundant, obsolete and trivial (ROT) data in file shares, cloud repositories and on people’s desktops which makes controlling the important information a lot more difficult. She wanted to focus on data critical to her business and get rid of everything else. I suggested automatically securing files as users create or edit them. This protects current information and lets her quickly understand what is used and what is not. Of course what would RSA be without some fun? Our hourly presentations were very lively and attendees got Starbucks cards, Fasoo hippos, headphones and an Amazon Echo. You had to really listen to the presentation to get some of the prizes, but the real fun started when Star Wars trivia came up. One gentleman had to perform for his prize making a convincing Chewbacca sound. There was even a little horse trading as the winner of one prize decided to swap it with the winner of another prize. 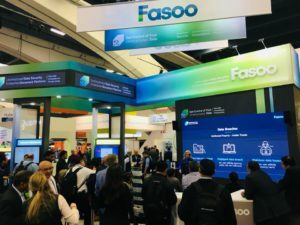 Visitors to Fasoo’s booth commented that the security solutions looked easy to use but still allowed them maximum protection of their unstructured data. This is always a critical issue as organizations try to balance security with productivity. Automating the processes of identifying, classifying and encrypting sensitive files allows employees and business partners to focus on their jobs rather than worrying about how to protect business critical information.